Located at the West end of the Midwinter Fair's central Court of Honor, the Administration Building was both a fanciful & functional structure. Containing the offices of the exposition's administrative departments, on three floors, the building was designed in a Persian-Arabic style, by architect Arthur Page Brown. 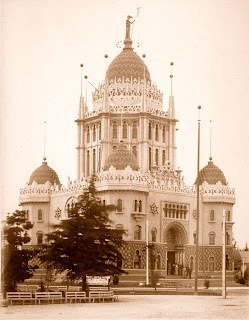 The dominant feature of the building was a 135-foot high central tower, capped by a golden dome, with four smaller domes topping hexagonal pavilions at the building's corners. All five domes were textured in a fish-scale pattern, causing them to resemble enormous pineapples. The exterior was tinted a warm cream, with bright pink used on the first level, and around the central Byzantine style doorway. Many windows, of various shapes & sizes, punctuated the exterior walls. The interior featured a central rotunda, rising to the height of the dome, ringed with balconies and decorated with fanciful murals. 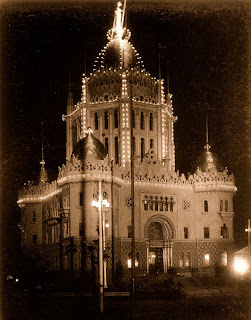 By night, electric bulbs outlined the structure's unique shape. 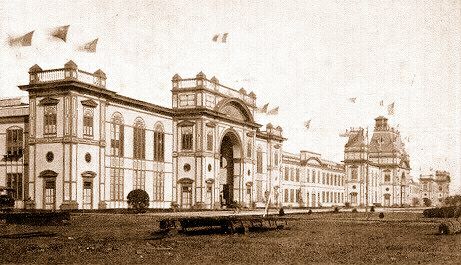 Following the close of the exposition, the building was demolished. The former site of the Administration Building is located behind the present-day Spreckels Temple of Music, in Golden Gate Park.